In India, dairy in the form of milk is widely consumed and is taken for protein and sustenance. I first tried a warm milk beverage scented with saffron and cardamom, containing ground almonds on a trip to Jaipur in Rajasthan. Served in a small clay vessel on cooler evening, the warm drink was delightful, filling and almost like a whole meal-in-one. It’s a perfect sustenance beverage, that’s dessert-like at the same time. 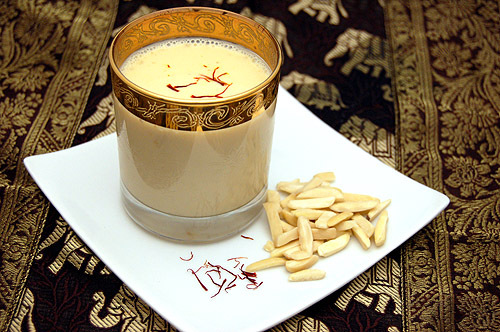 This is known as Kesar Badam Doodh ~ Saffron Scented Almond Chai Spiced Milk. It's quite rich and when I had it, was quite sweet as well. Options for this recipe is to omit the sugar, add a pinch of turmeric or use almond or cashew milk. 1) In a medium saucepan, bring milk to a boil with almond, ARVINDA'S CHAI MASALA, saffron strands. Sweeten with raw cane sugar, honey or jaggery. Serves 2.